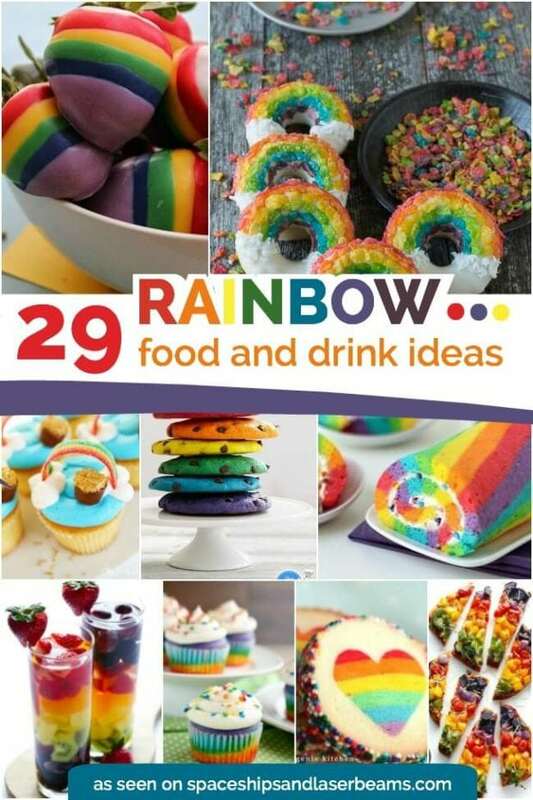 If you love showy food and drinks, you’ve got to see the 29 colorful rainbow food and drink ideas we put together! A dessert table with a rainbow of strawberries, meringue cookies and parfait is ready to party. Snack mix, veggie salad and salmon look lovely in color. From rainbow sangria to rainbow veggie pinwheels—or pizza—you’ll find a wealth of ideas that will definitely add some color to your life! Surprise your friends and family with Cream Egg Cracker Toffee for a special Easter treat. You do not need an excuse to make delicious Red Velvet Cookies. 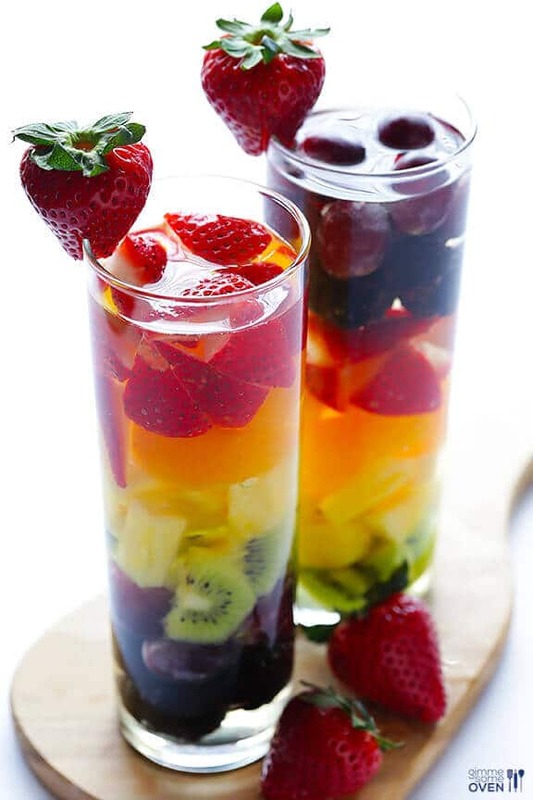 This Rainbow Sangria is so full of fruit that you can basically call it a healthy meal, right? I mean, you’ve got to get those servings of fresh fruit in somehow! Delicious white wine and brandy based sangria is refreshing on a hot summer’s day, and the addition of rainbow colored fruit is both fun and tasty. Muddle away so that you can taste even more fruity goodness with that wine. You will not be able to take your hands off of these amazing and colorful rainbow donuts. 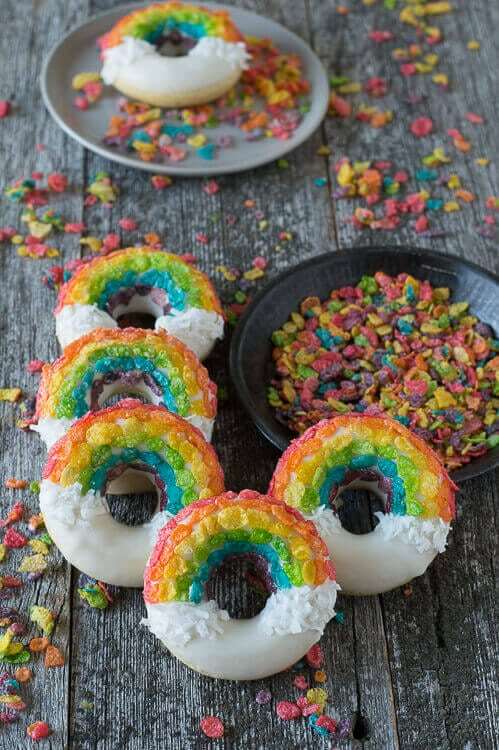 These fun treats are made with simple vanilla donuts topped with a rainbow of fruity pebbles cereal, melted white chocolate, and shredded coconut. It takes a bit of time and effort to separate all of the different colors of the fruity pebbles rainbow, but it is totally worth the result. Using pre-made bread dough makes this Rainbow Bread a little quicker to throw together and completely stress free to bake. 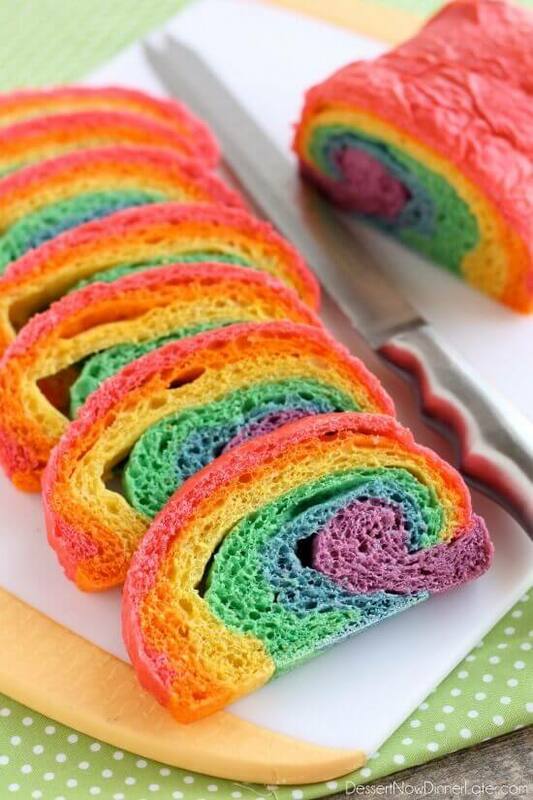 Swirls of red, orange, yellow, green, blue, and purple make the most colorful bread you have ever seen. A sandwich made out of this bread would be astoundingly gorgeous, plus it would be perfect for St. Patrick’s Day celebrations or rainbow birthday parties. 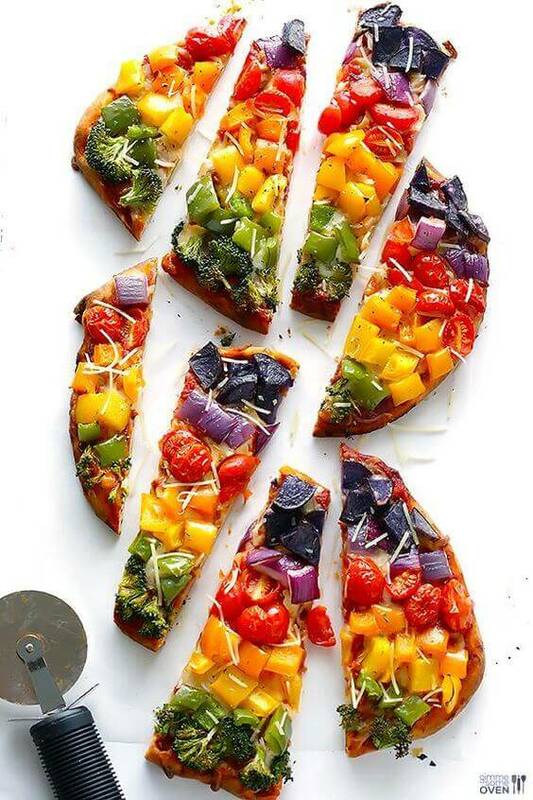 If you are struggling to get your kids onto the veggie-loving bandwagon, make healthy fun with this incredible Rainbow Veggie Pizza. It is a great way to get all kinds of veggies into your diet, and kids are guaranteed to love it. The recipe uses a quick and easy, not to mentioned lightened up, pizza crust solution – store bought flatbread! The best news is that this veggie pizza only takes a few minutes to whip up. Jelly rolls or cake rolls are actually surprisingly easy to make, and one of the best desserts to serve to a crowd. 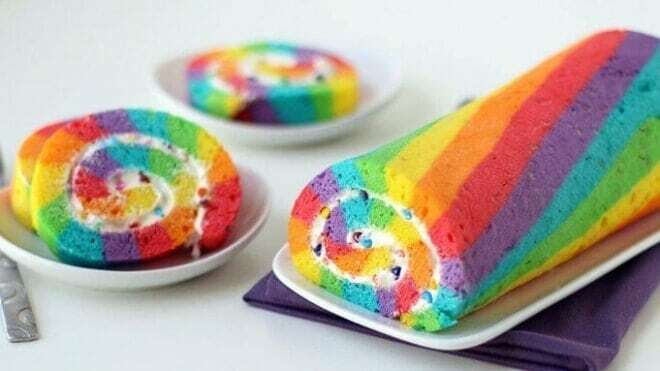 This Rainbow Cake Roll is definitely no exception. Beautiful, colorful strips of cake mix are baked together to create the ultimate rainbow dessert. It’s then filled with the tastiest whipper rainbow chip frosting! Cupcakes are cute, but layered rainbow cupcakes are just about the cutest things you will ever see. They are made with a simple boxed white cake mix, doctored up with some bright gel food coloring layered to make a delicious edible rainbow. They are topped with a swirl of whipped cream cheese frosting and a sprinkle of round rainbow sprinkles. These cupcakes are so easy, and so fun. 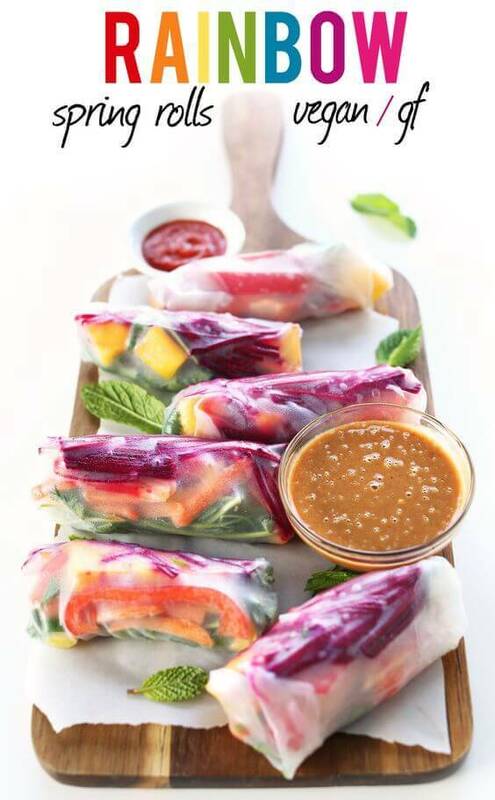 Lighten up your lunches with these healthy and nutritious, not to mention delicious, rainbow spring rolls. It all starts with a rainbow of crisp, fresh fruits and veggies for a full spectrum of colors and health benefits. Expertly wrap your fillings with rice paper, then it’s onto the sauce. Tasty homemade peanut sauce elevates these spring rolls to amazing, with an extra kick from fresh grated ginger. 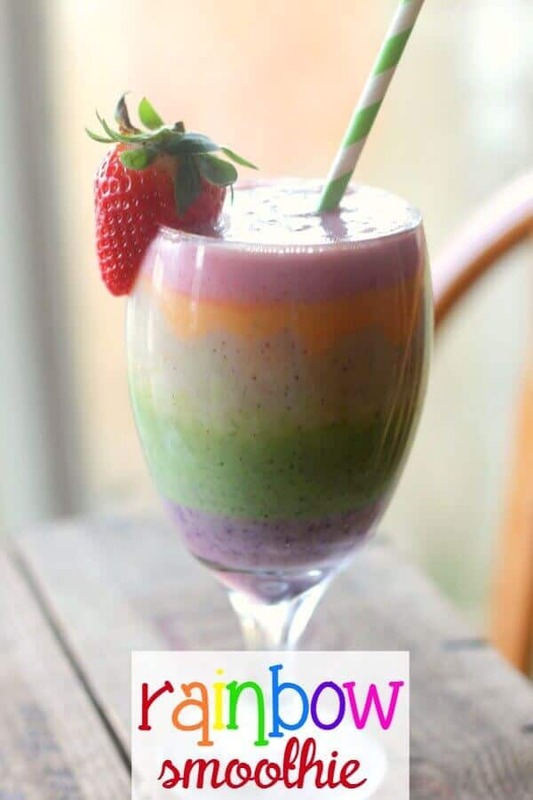 Whether your kids love to eat healthy with a variety of fruits and vegetables or not, they will slurp up this yummy rainbow smoothie. Not only does it look incredibly fun, but every layer is fruity and delicious. This recipe is another great way to get kids introduced to new flavors and fruits by putting them in a familiar smoothie. It’s a fun way to squeeze a whole bunch of your daily servings of fresh fruit into a single meal. 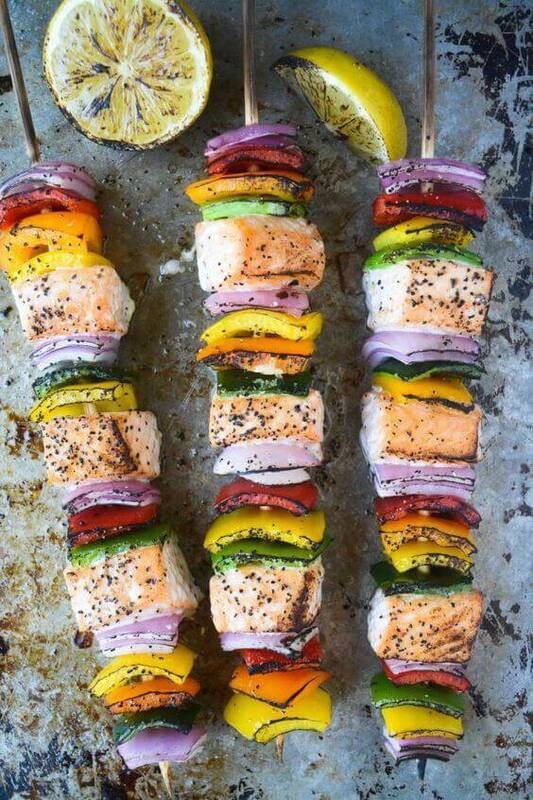 Rainbow Salmon Skewers are an easy and healthy meal perfect for barbecue season. They make a delicious 30 minute meal that are fun to make with your friends or kids! Cuts of fresh salmon fillet are stacked high with multicolored bell pepper, red onion, and a squeeze of fresh lemon. Serve the skewers on top of a green salad for a light meal, or on a bed of flavored couscous for a more substantial dinner. 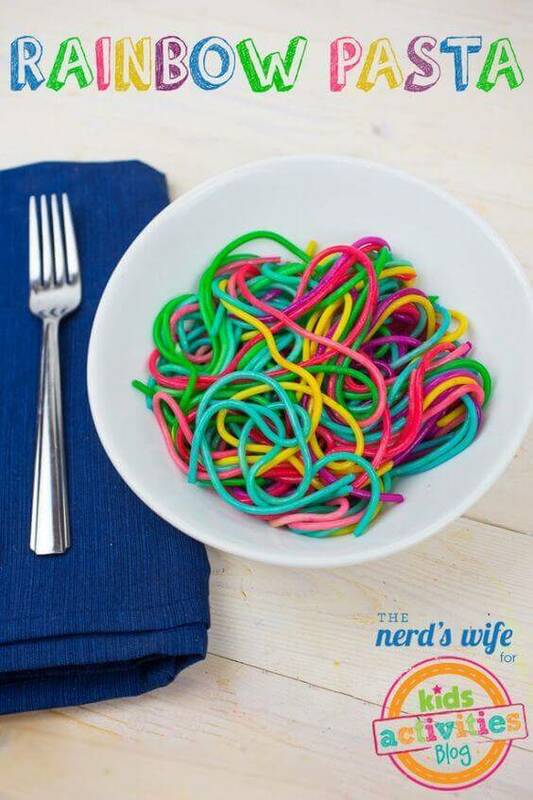 Making this colorful Rainbow Pasta is an exciting activity that kids can do almost all on their own. Though it might get a little bit messy, embrace the mess and let it be a part of the fun! Cooked spaghetti noodles get soaked in food colored water for just a few minutes, then strained with cold water to remove any excess. Mix all the noodles together for a colorful pasta dinner that even the pickiest eaters can’t turn down. Colorful Rainbow Fruit Salad Parfaits are an easy snack to put together, and would be a great way to sneak some healthy fruit onto the dessert table at home or at your next children’s party. 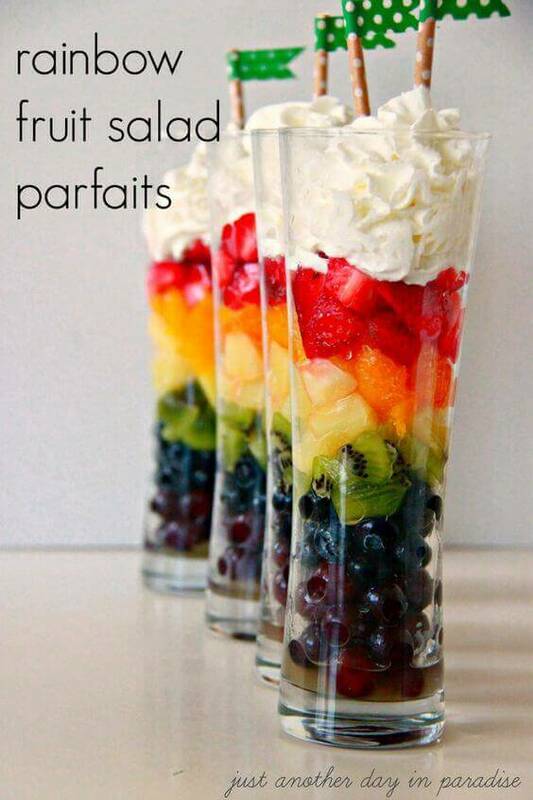 Grapes, blueberries, kiwi, pineapple, mandarin oranges, and strawberries are layered to create a beautiful rainbow treat. A splash of vanilla and scoop of powdered sugar in the fruit salad give this parfait a truly magical flavor. My family loves eating fruit, but sometimes we just buy way too much. 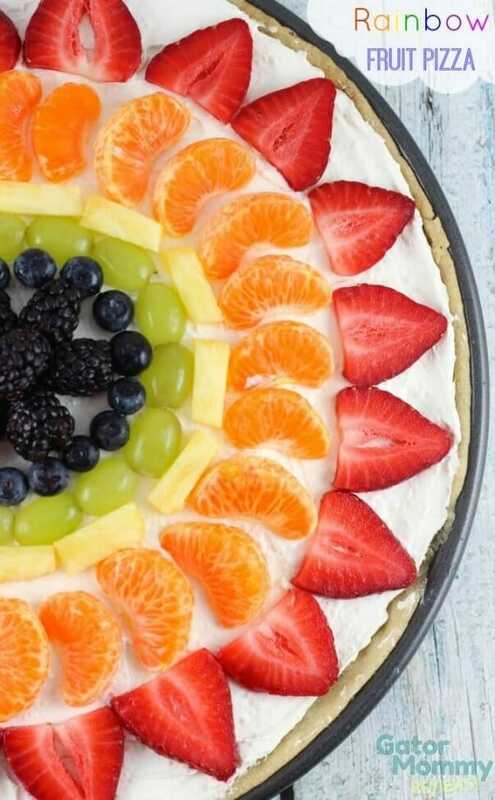 Use up all of the extra fruit in your fridge with this sweet and delicious Rainbow Fruit Pizza. A sweet shortbread cookie crust gets covered with a cream cheese spread and topped with fresh sliced fruit. Strawberries, clementine, pineapple, blueberries, and grapes make the perfect toppings. It’s a delicious and beautiful dessert that is perfect for picnics and barbecues. This fresh and crisp Greek Rainbow Vegetable Salad can be made and dressed ahead of time, making it perfect for parties and potlucks of all kinds. 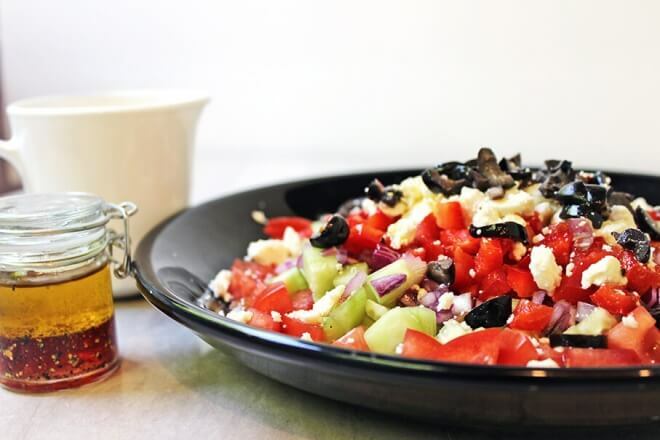 Fresh chopped red onion, cucumber, yellow bell pepper, red bell peppers, and tomatoes are topped with rich feta and Kalamata olives. The whole thing gets tossed in a savory red wine vinaigrette dressing. It is a fresh and healthy salad great for a dinner side or light lunch. Jell-O comes in so many delicious fruity flavors, making it difficult to choose which one to make. Solve that problem and make all of the flavors by creating this impressive rainbow Jell-O. Layer flavors of all of the colors of the rainbow in a baking sheet, then slice the final product into single bite cubes. This colorful, wiggly treat is great for birthday celebrations. 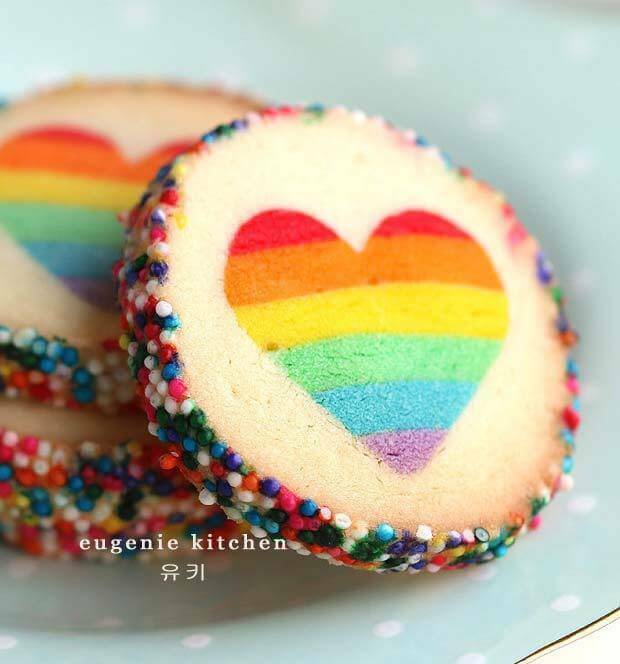 These rainbow shortbread cookies will really steal your heart (excuse the pun)! They seem time consuming, but you definitely have to give them a try at least once. They would make the perfect treat for someone special on Valentine’s Day, a birthday, or a just because gift. Once you roll out the bright multicolored dough, it is surprisingly easy to make the heart punch outs with a shaped cookie cutter. Roll in sprinkles for the cutest extra special something. The rainbow has never tasted so good. Chocolate covered strawberries are one of my absolute favorite treats. The sweetness of white chocolate paired with a fresh picked strawberry will have your taste buds screaming for more. 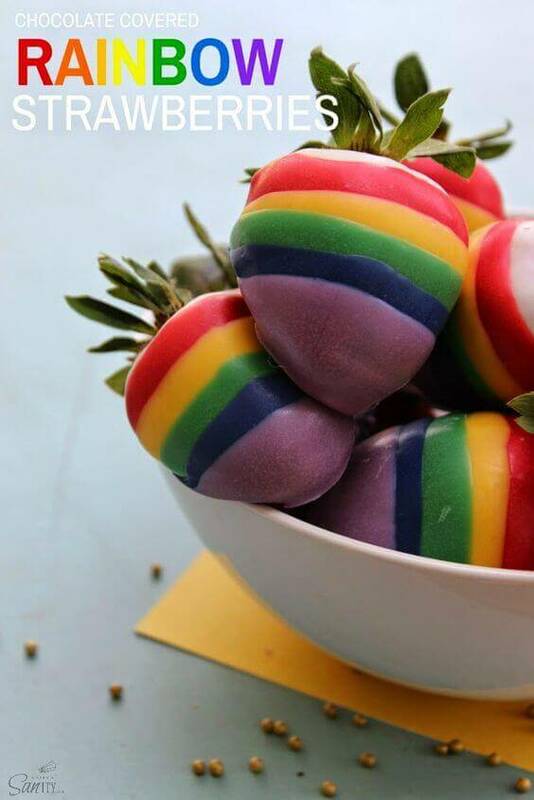 A fun twist on the original dessert, these chocolate covered rainbow strawberries are dipped in layers of colored chocolate for a fun, striped, rainbow effect! 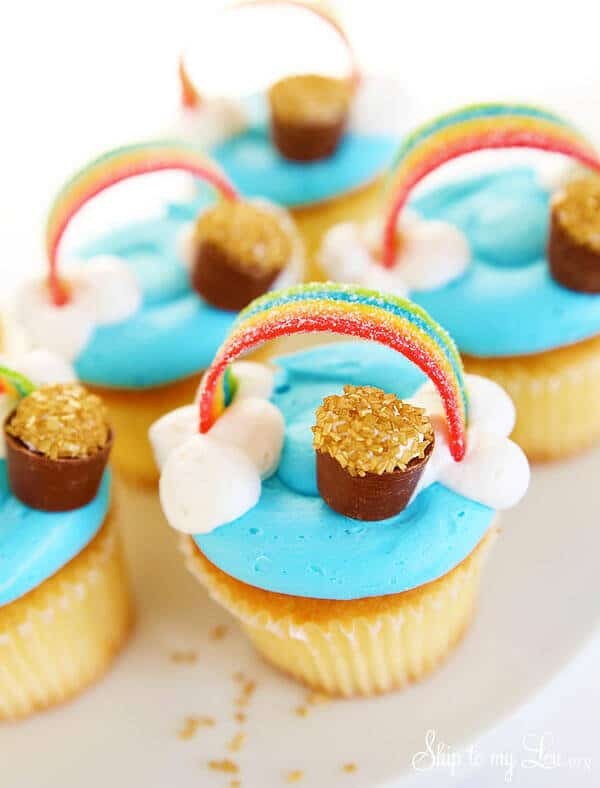 Candy makes up all of the precious details on top of these fun rainbow cupcakes. Fluffy white buttercream clouds hold an Air Head candy rainbow, and a glittery gold sugar dipped Rolo chocolate makes the perfect pot of gold. 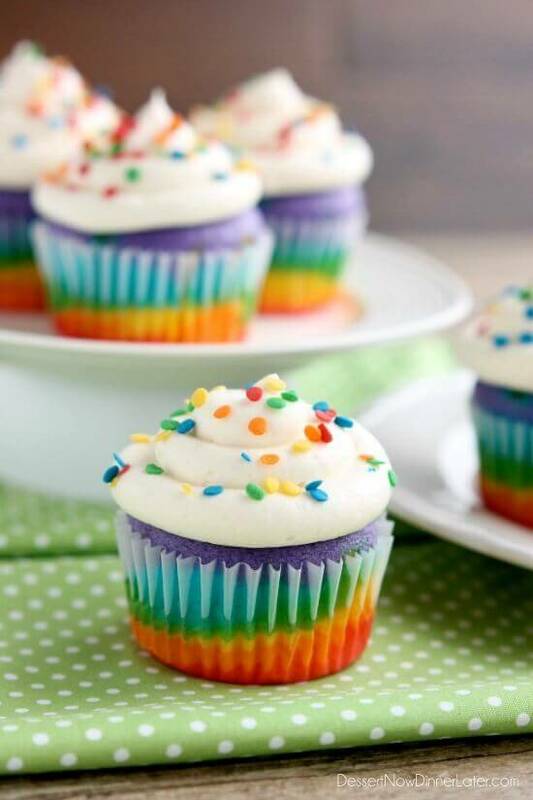 You will never believe how easy it is to decorate these cupcakes, and they look adorable at any rainbow themed event. 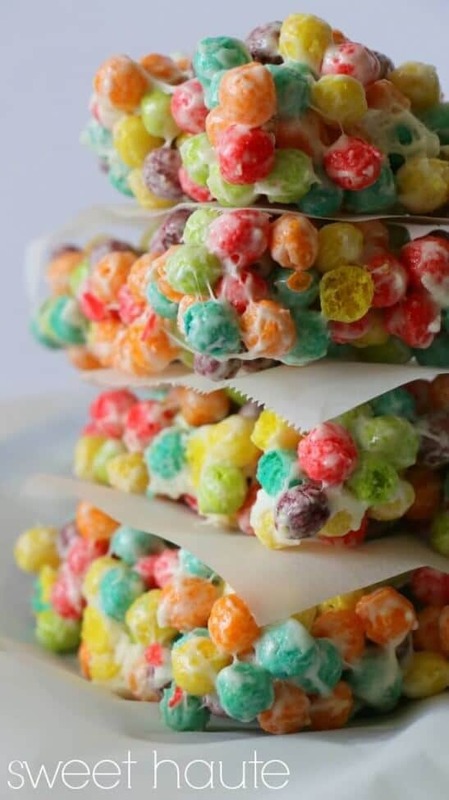 Switch up the typical rice krispie treats with these wildly fun Rainbow Trix Krispie Treats! Kids love this baking project, and your whole family will love eating them when they are done. The best part? These are super easy to make with only three simple ingredients you might be able to find right in your pantry. 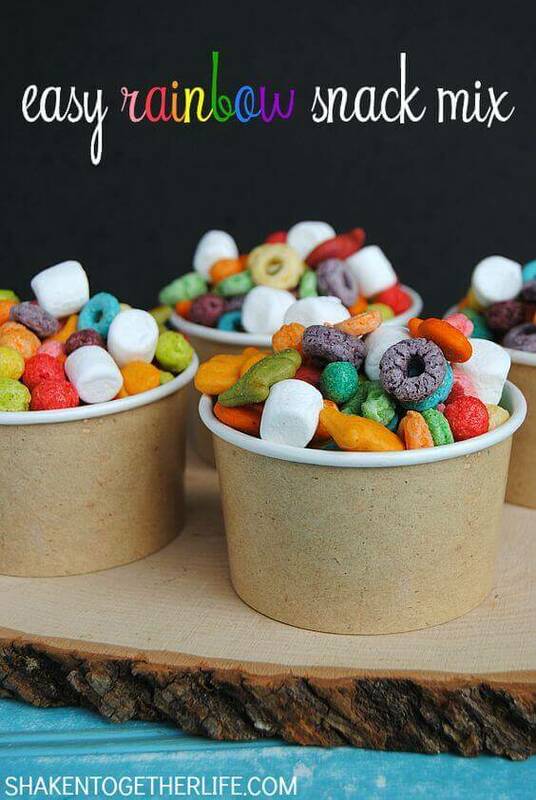 Grab some Rainbow Trix, a bag of marshmallows, a few tablespoons of butter and you are all set. It is a widely accepted fact that unicorns poop rainbows and glitter. 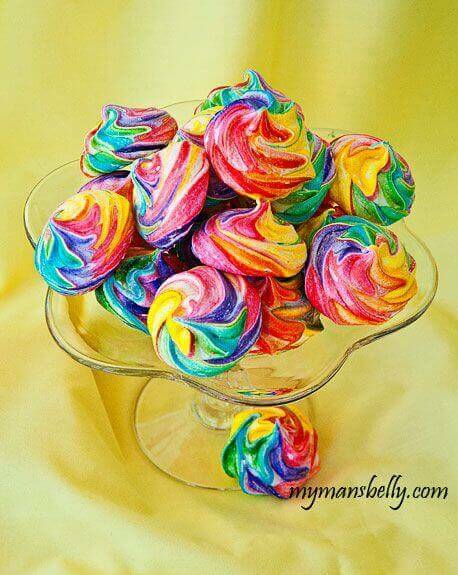 These fun and funny rainbow meringue cookies are dusted with just a hint of luster dust to give them that authentic unicorn poop shimmer and kids are guaranteed to go crazy over them once they hear the name. Otherwise known as Unicorn Poops, these cookies really are a cinch to make and taste so much better than anything you can buy at a grocery store. What do you think you would find at the end of the rainbow? I would place my bet on the fact that you would find these delicious End-of-the-Rainbow Cookie Parfaits! They are incredibly easy to make with a roll of Pillsbury refrigerated sugar cookie dough and some fresh shipped cream. The cookies are tinted with gel food colors, then crumbled to create an airy and colorful layered dessert. We are always looking for fun and innovative ways to serve healthy snacks at parties to make kids actually want to eat them. 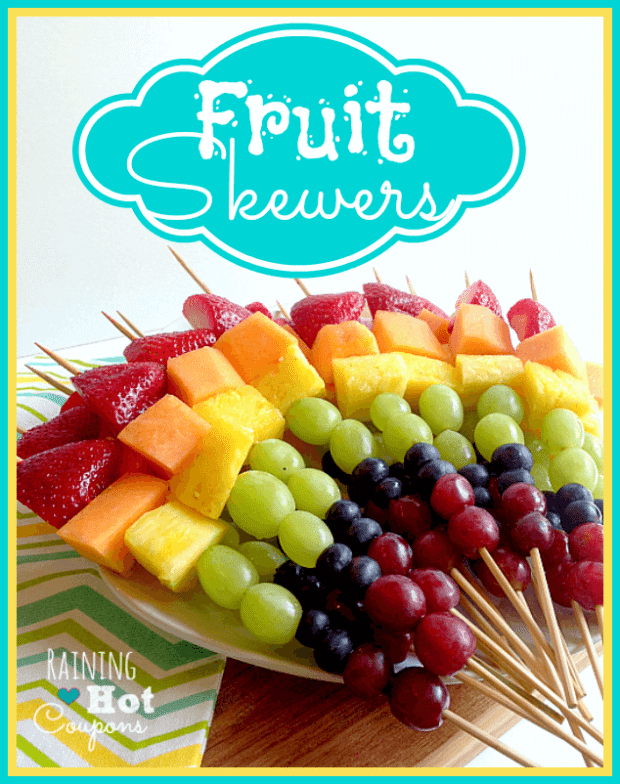 Rainbow Fruit Skewers are full of nutrients, look gorgeous on a dessert table or in a lunch bag, and taste great. You can even enlist your kiddos to help make these, just remind them that the ends of the skewers are sharp. Also mix some honey and plain yogurt to make a delicious fruit dip. Almost every kid out there loves the sticky, gooey texture and sweet taste of jumbo marshmallows. 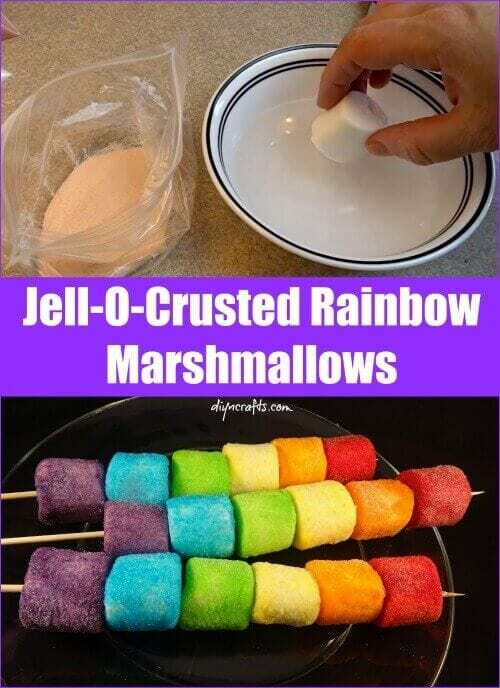 Amp up the fun factor with this quick and easy tutorial for making Jell-O Crusted Rainbow Marshmallows. They are so easy to make that the kids can practically do it on their own. All you need is a pack of plain marshmallows, different flavors of Jell-O, and a plastic sandwich bag for each flavor. Get dipping! 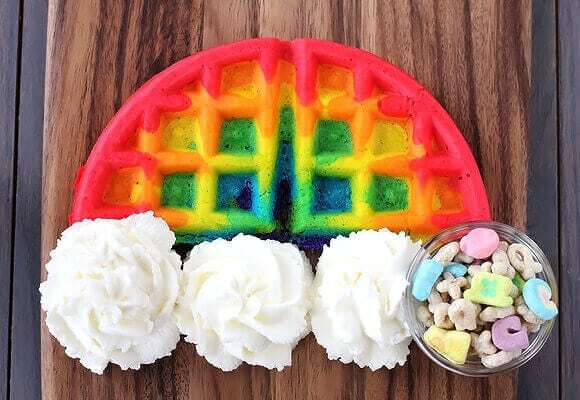 Serve up an extra special breakfast at your next slumber party, birthday brunch, or St. Patrick’s Day celebration with these wonderful rainbow waffles. The waffles themselves are easy to make by separating waffle batter to color with food dye, and piping the batter onto the waffle iron. Serve to your guests with three dolloped whipped cream clouds and a Lucky Charms cereal treasure at the end of the rainbow. Have you been inspired to throw a rainbow themed party yet? We sure have! The very first thing I would put out on the snack table is this Easy Rainbow Snack Mix. Filled with tasty nibblers and healthier treats, these single serve snack mixes are perfect for children and adults alike. The colorful sweet and salty mix includes marshmallow “clouds”, Rainbow Trix, Goldfish crackers, and Froot Loops cereal. These Rainbow Cookies are fun and easy to put together, and work really well to make ahead. 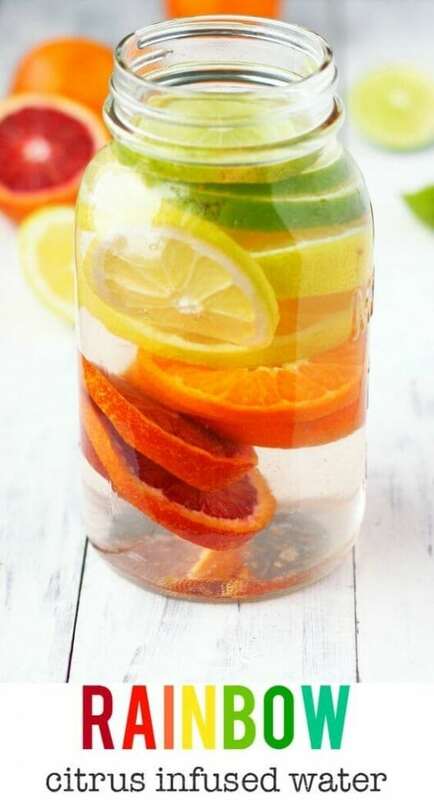 Adding fruit to your water is a great way to add a little flavor and zest, and that is definitely what you will be getting with this Rainbow Citrus Infused Water. A variety of fresh citrus fruits including blood orange, lemon, and lime, get layered up inside a mason jar. The jar gets filled with ice water and placed in the refrigerator for the flavors to soak in. It is a gorgeous looking drink with healthy benefits like a boost of Vitamin C.
Looking to refresh your school lunch recipes or at home snacks? Check out these delicious and nutritious loaded Rainbow Veggie Pinwheels! 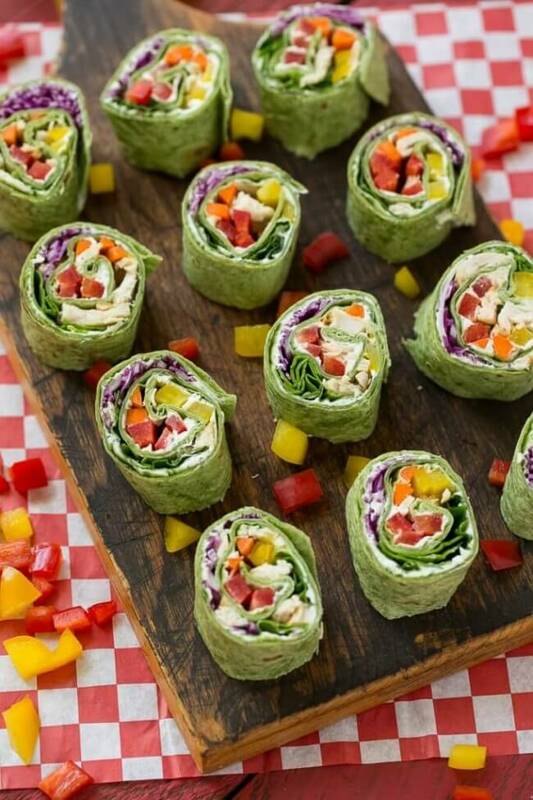 A rainbow of fresh chopped veggies with ranch flavored cream cheese are all rolled up inside a soft spinach tortilla wrap. You can totally customize these to the tastes of your kids, but some our favorite veggies fillers are red bell pepper, carrots, shredded purple cabbage, and green beans. This light and refreshing Rainbow Fruit Salsa Cheesecake Dip is bursting with sweet fruit flavor. A fruity layer made of blueberries, pineapples, mangoes, strawberries and more lay on a bed of creamy lemony no bake cheesecake served with crispy cinnamon churro chips to dip. This dip is a delicious make ahead dessert or appetizer that no one will be able to resist. I’ve never had a communal dessert like this, and it definitely looks like it’s worth trying. 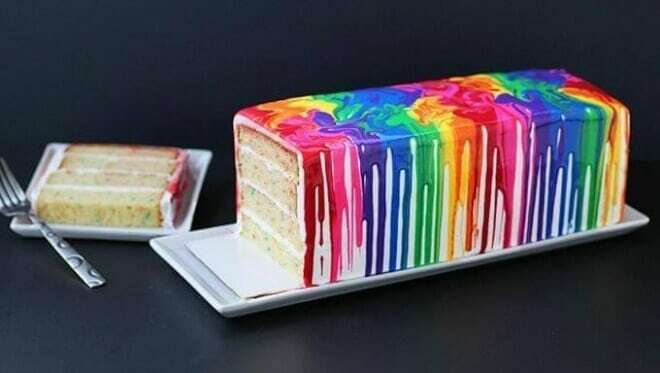 Serve up this showstopper melted rainbow cake to really wow your guests, without a ton of hard work! Start with a basic rainbow chip cake mix and store bought whipped white frosting, then spruce it up with food colored white chocolate drizzle. Pour the melted colored chocolate over the top of the cake, letting the colors swirl together and drip over the sides. The result is an absolutely stunning dessert that your guests will think you spent hours on! Make your own rainbow treat with these Amazon affiliate links gathered by the crew at Spaceships and Laser Beams. 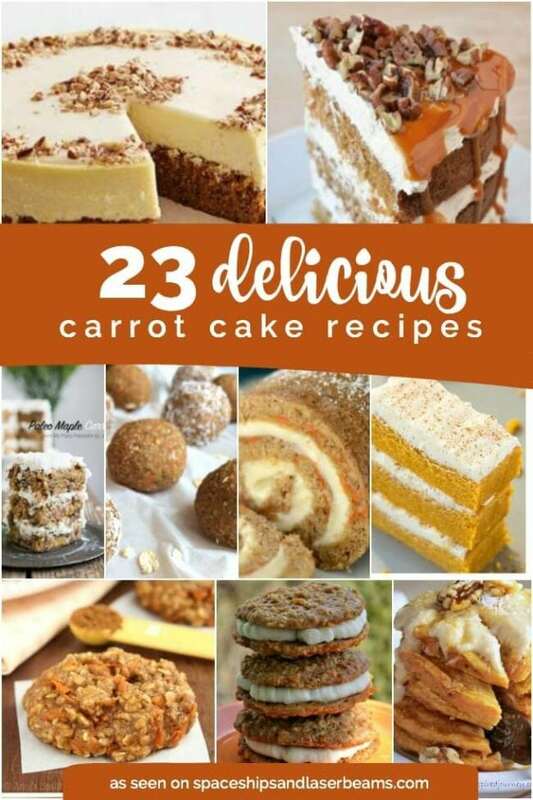 Don’t miss more dessert ideas perfect for Spring.